Our June 2018 summary of global economic & financial market events. It was an eventful June across financial markets with a plethora of economic data, trade and oil market developments, as well as monetary policy matters to keep investors occupied. Yet as the macroeconomic and earnings growth backdrops remained largely solid, several market risks managed to suppress investor appetite. There were plenty of reasons to celebrate Canada’s 151st birthday this past weekend, as the nation has enjoyed a year of successes. The economy is running at full capacity, jobs are abundant, wages are growing, and exports are rising. Nevertheless, a cloud of uncertainty is darkening the outlook for next year amid an eroding trade relationship with the United States, concerns over an aging business cycle, and housing market risks. The stricter mortgage rules that took effect in January have cooled the country’s hottest markets, but have not precipitated the kind of crash many analysts had feared. 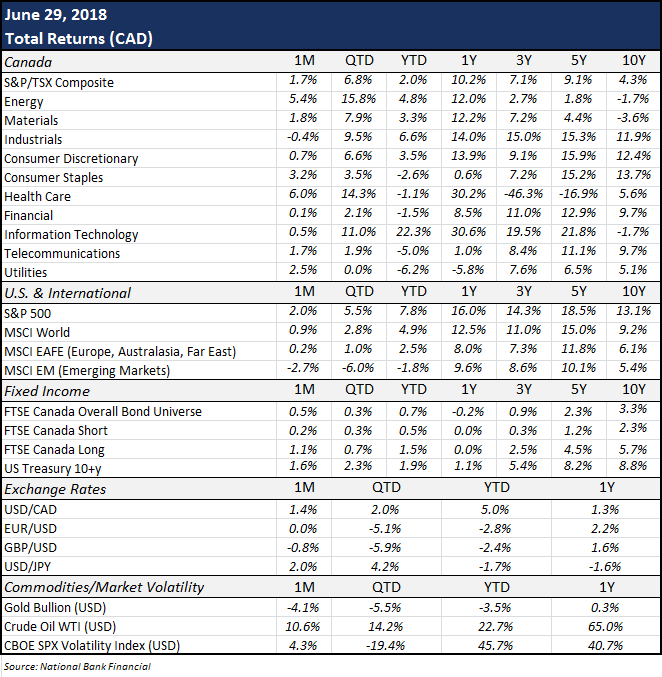 June’s bond market news was dominated by diverging monetary policies from the Bank of Canada, Fed, European Central Bank and Bank of Japan. While the era of quantitative easing has clearly ended for the U.S Fed, whose June rate hike was supported by continuously solid U.S. economic data, the path toward Canadian monetary policy normalization has become clouded in the face of housing market softness, elevated debt levels and escalating trade tensions. Across the pond, the ECB has long been among the handful of central banks still delivering stimulus, and technically still is, with QE set to continue throughout 2018. However the Bank laid out its plan to gradually wean the European economy from the stimulus last month. Meanwhile, Japan will lag its peers in dialing back crisis-mode policies, motivated to maintain ultra-low interest rates due to sluggish inflation and large levels of public debt. Yet all in all, global QE is on course to end later this year (see chart), and bond markets’ pri mary concern will be the degree to which central banks raise forecasts for growth, inflation and interest rates. In terms of performance, the gap between investment-grade and high-yield corporate bonds widened in June, the latter asset class continuing to outperform its higher-rated counterparts amid rallying oil prices, robust economic data, and equity market strength. The broad bond market (FTSE Canada Bond Universe) returned 0.5% last month. Equity markets began the month shrugging off the G7 trade spat between President Trump and Prime Minister Trudeau as much ado about nothing. AT&T’s court approval to buy Time Warner was a turning point for the media industry, as it improves the backdrop for M&A activity. Media and telecom stocks advanced following the announcement. Expanding valuations have been a significant driver of stock gains during this long bull market, and corporate earnings growth remains stellar. Nevertheless, pressure on world shares mounted last month, with escalating trade tensions impacting investors’ risk appetite. Although stock prices seemed stuck in one-step forward, one-step backward mode, they closed the month in positive territory. The TSX, S&P 500 and MSCI World Index respectively returned 1.7%, 2.0% and 0.9% last month (CAD). In oil markets, OPEC announced an agreement to modestly increase production last month. The move is intended to stabilize inventories, thus preventing the gap between global demand and supply from widening excessively. Tightening oil market conditions and concerns over U.S. sanctions on Iranian exports caused oil prices to hit a 3.5-year high at the end of the month. Benchmark crude oil prices advanced 10.6% in June. In currency markets, the loonie lost ground in June amid the litany of trade uncertainties. Further adding to the retreat was Canada’s unexpectedly sluggish inflation and retail sales readings. The currency stabilized toward the end of the month after BoC Governor Stephen Poloz’s stated that the economic big picture still supports stimulus withdrawal despite trade risks, as inflation had reached the Bank’s 2% target rate. In the meantime, the greenback advanced to one-year highs following an increase in Treasury yields, closing the month trading at 76 cents against the loonie. Le Groupe financier Kerr a été fondé en 1979 pour aider les particuliers à maximiser leurs ressources financières personnelles, pour répondre à leurs préoccupations en matière de finance et de planification de la retraite et pour simplifier l’administration de leurs affaires. Votre succession pourrait être assujettie à l’impôt successoral américain! Quel degré de risque devrais-je accepter pour atteindre mon objectif financier ?